In May 2012, there were lots of happy young faces at the Clearing House of the SOS Children’s Villages in Salzburg-Aigen. 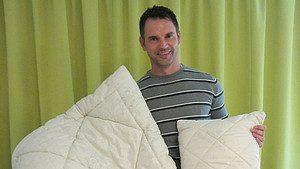 Wenatex presented the institution 40 duvets, 40 pillows and the respective bedclothes.Along with the adolescents, Johann Svager, head of the SOS Children’s Village Clearing House, is delighted to receive the dreamlike “support” from Wenatex. This support came at just the right time, because the house in Aigen has recently undergone extensive renovation operations. Thus, the residents in ages ranging from 13 to 18 were not only able to take pleasure in the newly renovated rooms, but can also enjoy restful sleep in the comfort of new duvets and pillows.Wenatex has been committed to supporting a number of social projects during the course of many years. The company has regularly provided support to the charitable organisation of the SOS Children’s Villages, which offers children around the world, who find themselves in difficult circumstances, a home within an atmosphere of love and care.